WHEN IS THE PRICE TO PROTECT A NATION’S LEGACY TOO HIGH? Archaeology Professors James Acton and Laura Palmer are on safari in South Africa, enjoying a vacation away from the bullets and bombs that too often threaten their lives, when a chance encounter leads to a clue that could unlock the greatest mystery remaining of the Boer War over a century ago. The location to over half a billion dollars in gold. It’s a treasure that has claimed dozens of lives, and is about to claim even more. 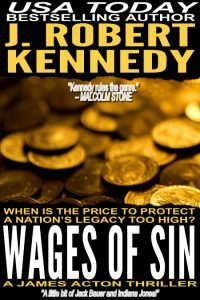 Four-time USA Today Bestselling author J. Robert Kennedy delivers another torn from the headlines thriller with Wages of Sin. Filled with intrigue, suspense, humor and a touch of romance, prepare to lose sleep with this action-packed adventure the likes of which only Kennedy can deliver. With over 500,000 books in circulation and over 3000 Five-Star reviews, it’s time to join those who have compared him to Patterson, Clancy, Brown, Cussler and Rollins. The closest thing to a Damfino I could find. When Bob Crampton sent me his email describing this concoction, I knew it would only be a matter of time before I tried it. It would have been minutes later, but having no hot dogs in the house, I was delayed. I then kept forgetting to put them on my grocery list, so it took a few weeks before I was looking for the cardiologist approved bacon (oddly, there was none), when my eyes were drawn to the hot dogs and I remembered the email. And the culinary experience invented forty years ago in San Diego was recreated in my house, with a lifter in one hand and the phone in the other with 9-1-1 already punched in, just in case I had a sudden heart attack from the grease and sodium. So I’m going to assume Bob was young when he invented this thing, America had no clue about heart disease, cholesterol or high blood pressure, and when you’re young, who gives a s**t about that stuff anyway? But his invention has now been immortalized in print and eInk, and now perhaps enjoyed in new households around the world. But when your paramedic asks what you were thinking, don’t blame me. And for those of you who haven’t read the new book yet, and still are wondering what a Damfino is? It’s D-A-M-F-I-N-O, as in, “Damned-If-I-Know”. Read the book for the full explanation of how this name came about. 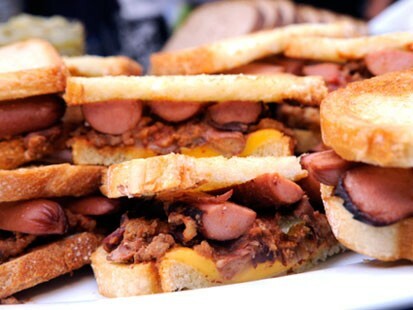 And how many calories are in this concoction? If you’re hungry, make yourself a sandwich, download the new book, and enjoy them both. And if you’ve got any crazy culinary creations, send them to me. It might just make it into the next book! Now I’m off to Wendy’s to get a Baconator sandwich. 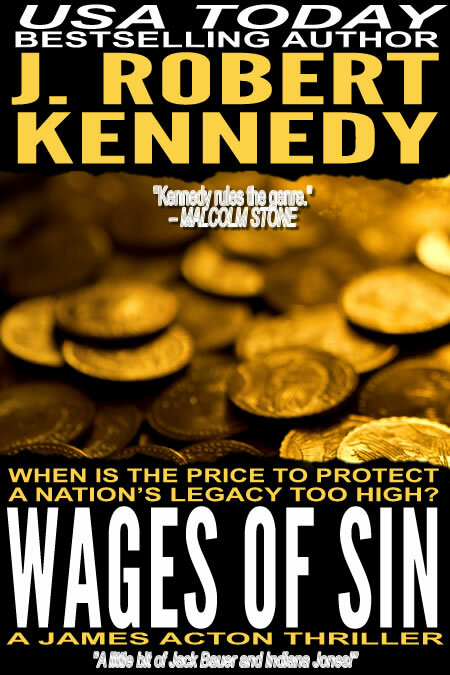 Wages of Sin, the latest novel from USA Today bestselling author J. Robert Kennedy, now available in print and eBook format wherever books are sold.